Here he goes again. The Ekiti State Gov. Ayo Fayose is leaving no stone unshackled in his critics of Gen. Mohammadu Buhari of the APC. In this latest mouthful, the governor called Buhari '' a Diaper-wearing old man''! 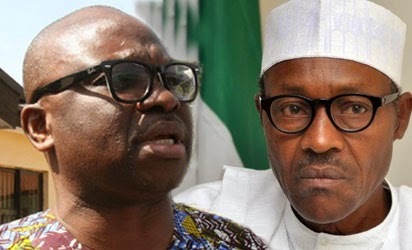 Ekiti State Governor, Mr Ayodele Fayose has described claim by the All Progressives Congress (APC) presidential candidate that he will fight corruption if elected as president as the height of deceit, saying; "a diapers-wearing old man surrounded and being funded by notoriously corrupt people cannot fight corruption." The governor, who said Buhari must first fight his own personal corruption and health issues before talking about fighting corruption in Nigeria, added that; "President Goodluck Jonathan is already fighting corruption by allowing rule of law to thrive, and this was acknowledged by the Transparency International (TI), which rated Nigeria as the 39th most corruption country in the world in 2014 as against the most corrupt country and second most corrupt country in the world that Nigeria was rated in 2001 and 2003 respectively." According to a statement issued on behalf of the governor by his Special Assistant on Public Communications and New Media, Lere Olayinka, "If Buhari cannot be above board on issues regarding his academic certificates and health status; he should as well tell the story of his plan to fight corruption to the marines." The governor said; "I have listened to Buhari saying everywhere he goes that 'I will fight corruption, I will fight corruption, I will corruption' as if that statement was pre-recorded in his brain and it's just being played back. Today again, the only word that came out of Buhari's mouth was 'I will fight corruption'. "Can a man like Buhari who can hardly do anything on his own because of ill-health fight anything? Can a man, who is contending with wearing diapers when he wants to sleep fight mosquitos not to talk of corruption? "Can a man, whose election is being funded with money from questionable sources fight corruption? Or is Buhari telling us that he also borrowed money to run his campaigns the way he 'borrowed' N27 million to obtain his party nomination form? "Most importantly, is Buhari going to fight corruption by jailing people for 400, 300, 200 and 100 years like he did when he was Head of State? Is he going to just dumped people in detention the way he dumped our illustrious fathers like late Chief Adekunle Ajasin, late Chief Bisi Onabanjo, Alhaji Lateef Jakande and late Chief Bola Ige, all of whom served Yorubaland diligently by giving us free education and free health? "I think Buhari should just face other issues and stop this replay of 'I will fight corruption' that was obviously recorded in his brain because President Jonathan is already fighting corruption and that has been acknowledged by the Transparency International (TI), which placed Nigeria as 39th most corruption country in the world in 2014 as against the second most corrupt country that Nigeria was rated in 2003. "It is a fact that in year 2000, Transparency International rated Nigeria as the most corrupt country in the world and the country only improved marginally in 2001 and 2003 when it was rated the second most corrupt nation in the world. It was only under the President Jonathan's government that Nigeria made steady improvement in Corruption Perception Index (CPI) by becoming the 31st most corrupt country in 2013 and 39th in 2014. "So, Buhari should tell us what else he intends to fight because under President Jonathan, corruption is already being fought, using global best practices."